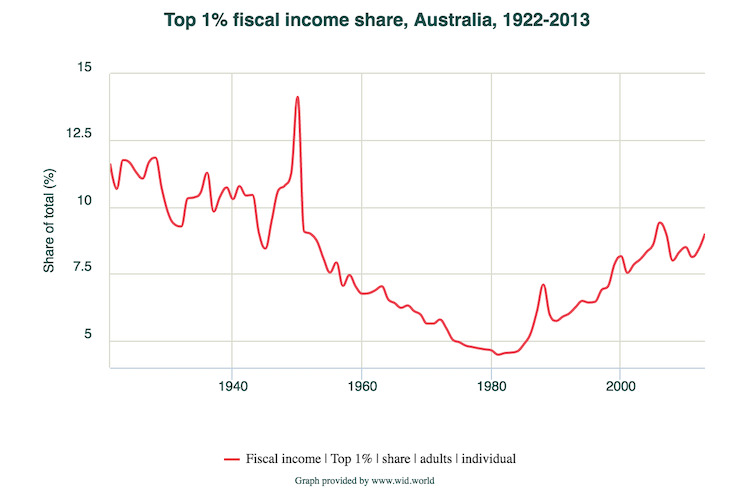 Wealth inequality remains a problem in Australia, but it is lower now than in the years leading up to the GFC. 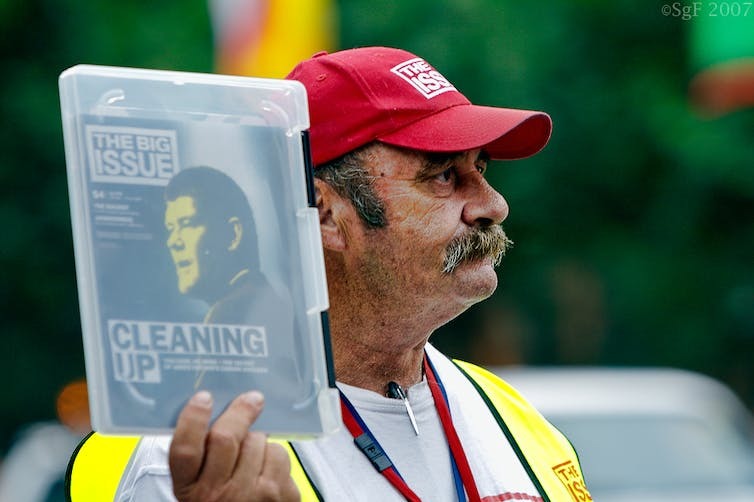 We hear a lot about inequality in Australia but the true picture is much more complicated than the headlines usually suggest. The data indicate that wealth inequality has grown but is lower now than before the global financial crisis (GFC). And while the personal incomes of the very rich have gone up, overall household income inequality has barely shifted since the start of this century. Economic inequality refers to the extent to which material well-being differs across people – how rich are the rich, how poor are the poor. But there are different ways to be rich, and different ways to be poor. Income inequality is about the gap between people with high incomes and low incomes. Wealth inequality, on the other hand, looks at the gap between people with high net worth (for example, a lot of houses, stocks or other assets) and people with low net worth (few or no assets). People could have very similar incomes but be at opposite ends of the scale when it comes to their wealth, for example. In practice, attention typically focuses on income inequality, although it is also important to consider wealth inequality. Since 2000-01, there have been three key data sources for examining income inequality in Australia: the Australian Bureau of Statistics’ (ABS) Household Income and Wealth surveys, the Household, Income and Labour Dynamics in Australia (HILDA) Survey that the Melbourne Institute has been running since 2001, and the Australian Taxation Office’s tax records data. The first two can also be used to examine wealth inequality. For various reasons, the three data sets do not tell exactly the same story about income inequality trends since the beginning of this century. Nonetheless, there are some key conclusions we can draw. The first conclusion is that the personal incomes of the very rich have grown somewhat more strongly than the personal incomes of the rest of the population. For example, data compiled by the World Wealth and Income Database (WID World) show that the share of income going to the top 1% rose from 7.5% in 2000-01 to 9% in 2013-14. Despite this increase in inequality of personal incomes at the top, measures of overall inequality of household incomes (as opposed to personal incomes) show relatively little net change this century. One way to track this is to look at the Gini co-efficient, a commonly used measure of inequality that ranges from zero to one. Zero means total equality, with everyone on the same income. A Gini coefficient of one means complete inequality, the equivalent of one person having all the income. HILDA survey data show that Australia’s Gini coefficient was 0.303 in 2000-01 and 0.296 in 2014-15. In other words, it has barely shifted. Being a longitudinal study, the HILDA Survey also allows us to consider inequality in incomes measured over longer intervals than one year. Incomes can fluctuate from year to year, and so we may get an exaggerated picture of income inequality if we examine only annual income. Some people who appear poor in one year may in fact have high incomes in other years and so, overall, are not really poor. The HILDA Survey indeed shows that inequality of income measured over five years is lower than inequality of annual income. However, of some concern is that measures of inequality of five-year income have been trending upwards since the early 2000s — although the increase is very slight. While that’s been happening, however, the labour market has become more unequal. Wage inequality is typically thought of in terms of inequality in earnings per hour worked, while labour market inequality more broadly could be thought of as inequality in total (annual) earnings across all persons in the labour force. Wage inequality has steadily risen and, moreover, the share of employment that is part-time has risen. Research published last year showed that the higher your pay relative to others, the more likely you are to get a better pay rise. On the surface, it is remarkable that the large rise in labour market inequality has not — at least, not yet — translated to large increases in income inequality. The reasons for this are complex, but an important contributor has been the relative concentration of employment growth in low-income households. Another potential reason why increased wage inequality has not translated to increases in income inequality is our system of progressive income taxes and transfers. However, this seems largely to not be the case in the 2000s in Australia, since the tax and transfer system actually became less redistributive (was doing less to reduce income inequality) over this period. So while the tax and transfer system has probably moderated the effects of increased wage inequality on income inequality, it has not completely neutralised it. In terms of wealth, both the ABS income surveys and the HILDA Survey indicate that wealth inequality grew strongly in the years leading up to the global financial crisis (GFC). The HILDA Survey, which has collected detailed wealth data every four years since 2002, shows that the wealth required to be in the top 1% of the wealth distribution increased by 140% in real terms between 2002 and 2006. This was a period in which both house prices and the share market were rising strongly. However, wealth inequality appears to have moderated slightly since the GFC, with the wealth required to be in the top 1% actually 9% lower in 2014 than in 2006. This appears to primarily derive from weaker share market performance. The ASX200, for example, was approximately 20% below its October 2007 peak in late 2014 (and even now is still over 10% below the peak). In light of the minimal changes in overall income inequality this century, and the evidence that wealth inequality is lower now than in the years leading up to the GFC, it is perhaps surprising that public perceptions appear to be that inequality is growing strongly. 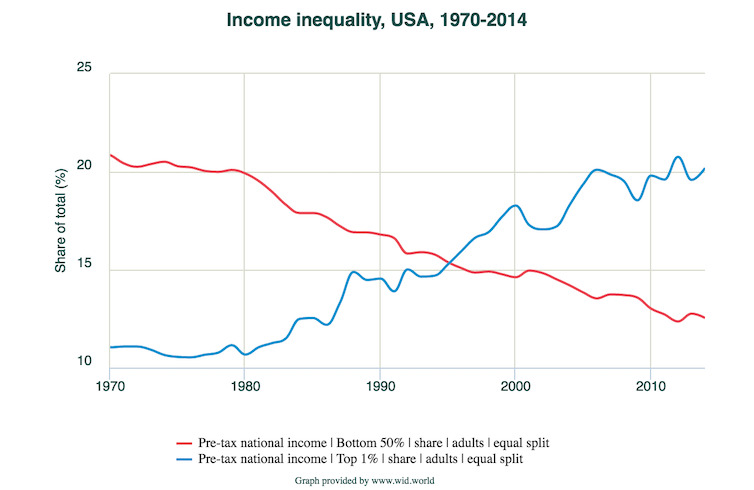 Income inequality has grown in the US more sharply than it has in Australia. Perhaps also important is that household income growth in Australia has slowed since 2008-09, and indeed has essentially stalled since 2011-12. In part, this reflects slowing wage growth, but also important has been relatively weak growth in employment, and in particular full-time employment. For example, the forthcoming HILDA Survey Statistical Report will show that, at December 2015 prices, the median “equivalised” household income – that is, household income adjusted for household size – was A$46,031 in 2011-12 and was still only A$46,007 in 2014-15. This stagnation in average living standards is arguably likely to lead to greater focus on the fairness of the income distribution. The link below is to an article concerning the future ‘Bibles’ of the digital age. This article suggests that people will download customised and personalised Bibles that will be made up of what people want in their Bibles – it had to come to this eventually. The technology already exists for people to do for themselves. International Christian Concern (ICC) has told the ASSIST News Service (ANS) that it has learned that more than 700 members of an Islamic extremist group, Boko Haram, escaped two days ago (Tuesday, September 7, 2010) after suspected fellow members of the group raided a prison where they were being held in Bauchi, northern Nigeria, reports Dan Wooding, founder of ASSIST Ministries. “A group of armed men attacked the prison at 6:40 PM and fought with the prison guards for two hours. At least four people were reportedly killed during the shootout,” said an ICC spokesperson. ICC stated that Christian leaders in northern Nigeria are alarmed by the massive escape of Boko Haram members. In July 2009, members of Boko Haram carried out attacks against Nigerian police officials leading to the death of more than 700 people. Members of Boko Haram also killed a dozen Christians, including Pastor Sabo Yakubu, Rev. Sylvester O. Akpan and Rev. George Orjhi. “[The escape from prison] is a clear indication of anarchy. Boko Haram is a threat to Christians in northeastern part of Nigeria where Christians were killed, including pastors killed and church burned down. More people could be killed if they are not checked,” said Rev. John Hayab. Rev. Hayab is the General Secretary of the Christian Association of Nigerian’s Kaduna State chapter. Note: ICC is a Washington-DC based human rights organization that exists to help persecuted Christians worldwide. ICC provides Awareness, Advocacy, and Assistance to the worldwide persecuted Church. For additional information or for an interview, contact ICC at 800-422-5441. Their website is: www.persecution.org.